A day-trip from Cape Cod to Nantucket can show you much of the island's beauty and history. You can enjoy the beauty and history of Nantucket on a day-trip from Cape Cod if you plan your time right. Same-day excursion tickets on some ferryboats are cheaper than round-trips with an overnight stay. Here is a typical itinerary. The timing of your trip may vary depending on whether you take a plane or a ferryboat. Your fast ferryboat or flight departs. Within an hour you are in the center of Nantucket, either by ferry (which arrives in the center), or shuttle bus from Nantucket Airport. Lunch at one of Nantucket's many restaurants and cafés, or pick up a sandwich or salad and drinks and have a picnic. Visit the Whaling Museum, the Science Center, one of Nantucket's historic houses, or wander, camera in hand, along the historic streets and alleys. Make your way back from beach or bike ride to Nantucket Town for a stroll, some shopping (or window shopping), and refreshments. Get ready for your return flight or ferry voyage. If you have a later one, continue your explorations on Nantucket. You may be back on the mainland by now, ready to return to your Cape Cod hotel and prepare for a seafood dinner. 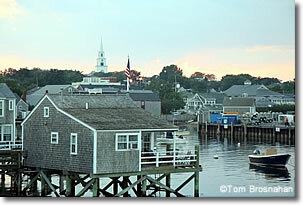 If you're still on Nantucket, there are ferryboats that depart the island as late as 10:00 pm (22:00).